Chingford Parish Church of St Peter & St Paul occupies The Green at the heart of Chingford, which is still very much an Essex town at heart, despite being within Waltham Forest since 1965. 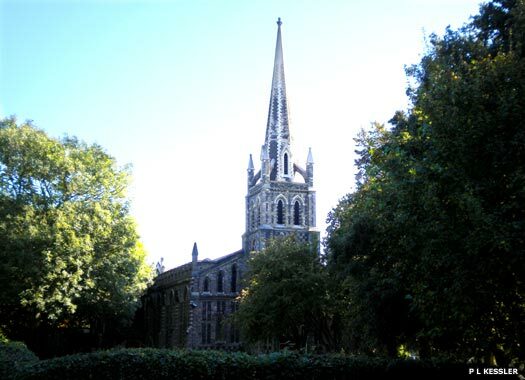 In 1840 the old parish church (now All Saints), was in such a bad state of repair that the decision was taken by the rector to abandon it and build this new church on Chingford Green. Designed by Lewis Vulliamy it was built at the rector's own expense and opened on 18 July 1844. By 1901 it was apparent that a bigger church was required and Sir Arthur Blomfield drew up plans for an extended chancel and naive aisles, which were completed in 1903. The twelfth century font was taken from the Old Church. The St Elizabeth Chapel was built onto the church in 1937, at the same time as the east window was added. On 13 October 1940, enemy bombing seriously damaged the chapel, but reconstruction had to wait until after the war. Chingford United Reformed Church occupies a large frontage on Buxton Road, to the north of The Green. 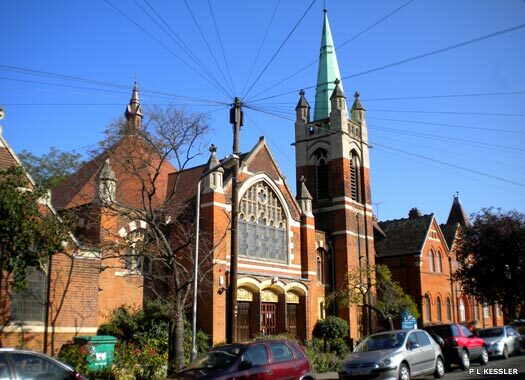 Founded as Buxton Road Congregational Church in 1888, meetings were first held in the Victoria Coffee Palace. 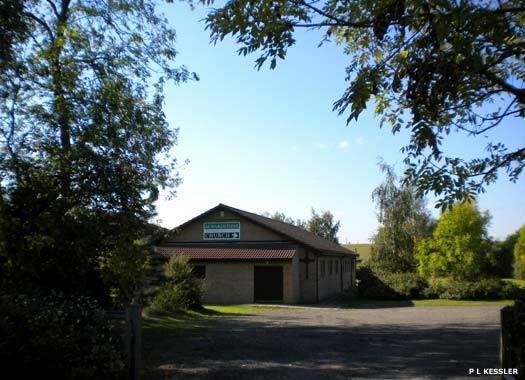 In 1889 a site was bought and services were held there in an iron building. The Spicer Hall (on the far right here) was opened in 1890 as a memorial to James Spicer of Woodford. The present church, adjoining the Spicer Hall, was built in 1910. 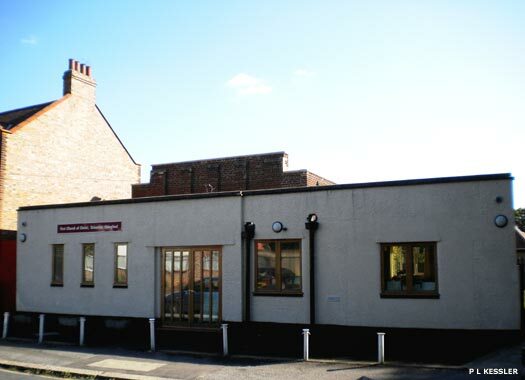 North Chingford Methodist Church is on Station Road, near to Queen's Grove Road. In 1898 the Wanstead and Woodford Wesleyan Circuit began to consider building a church at north Chingford. Little progress was made and responsibility was eventually transferred to the Clapton Circuit, which in 1905 erected an iron building in Station Road. 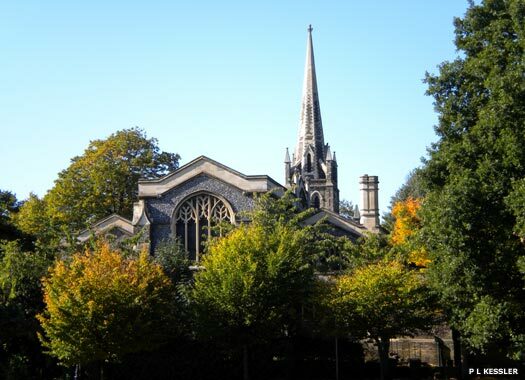 The present church, designed by George Baines & Son, was built in 1927. 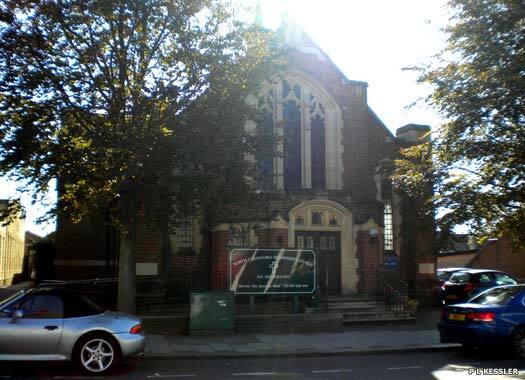 It is now in the Chingford Methodist Circuit, formed in 1941. 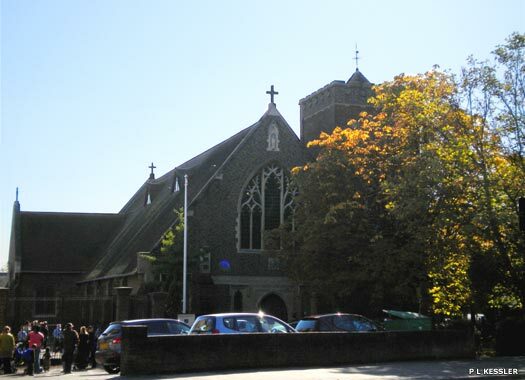 Our Lady of Grace and St Teresa of Avila Catholic Church lies at 1 Station Road, opposite St Peter & St Paul and on the corner with King's Road. The church was founded in 1919, but the main building was only put up later, being completed in 1931. The tower was added even later, in 1956. The porch over the south door on King's Road has some wood carvings of animals and fish among vegetation, but the dark weathered wood does not show up the carvings very well. King's Road Baptist Church is on the southern side of King's Road, on the corner with Scholars Road and opposite the side of Our lady of Grace. 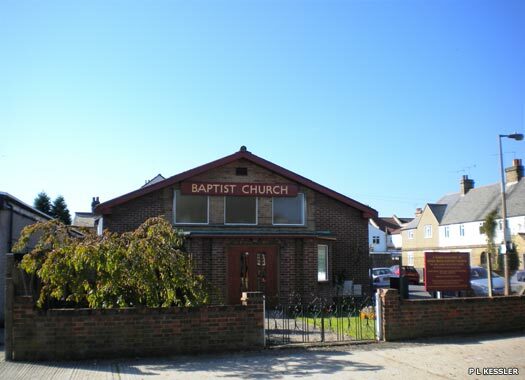 A Baptist mission at north Chingford (1888) and another at south Chingford (1901) were both taken over by the Buxton Road Congregational Church, so a Strict Baptist place of worship in King's Road was licensed in 1929, and a church was formed in 1934. The present church building was erected in 1953. First Church of Christ Scientist lies beside a footpath at the far end of the quiet and leafy Woodland Road, leading southwards off The Green. This branch of the Christian Science church, which was founded by Mary Baker Eddy in 1866 based on a belief that Man is spiritual rather than material, was opened in 1925, but the original building at the end of a row of terraced housing was replaced by the present simple brick construction, which was completed in 1937. Ridgeway Church is a few metres (yards) west of the Christ Scientist church, on the western side of The Ridgeway, at the corner of College Garden. 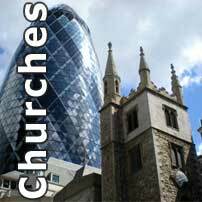 It is a contemporary mainstream Christian church which is independently governed, and not responsible to any denominational head office, instead being administered through its own elders, deacons and the wider leadership. However, the history of this comparatively modern building is unknown. 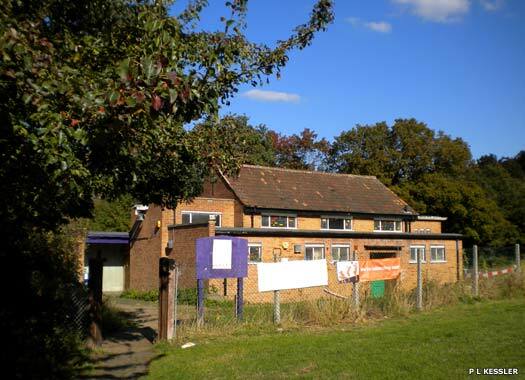 Sewardstone Evangelical Church is on the western side of Sewardstone Road, opposite Epping Way. The huge King George V Reservoir on the River Lea lies behind it (on the opposite side of the hill at the rear of the photo). In 1893 the Buxton Road Congregational Church opened a mission in Low Street (now Sewardstone Road), but this closed in 1903. The location is unknown, but it seems likely to have been here, although this building looks more recent. St Francis Hawkwood is at the easternmost end of Hawkwood Crescent, at the junction with Epping Glade, and on the northern side of that junction. It is the last church before the Essex border. 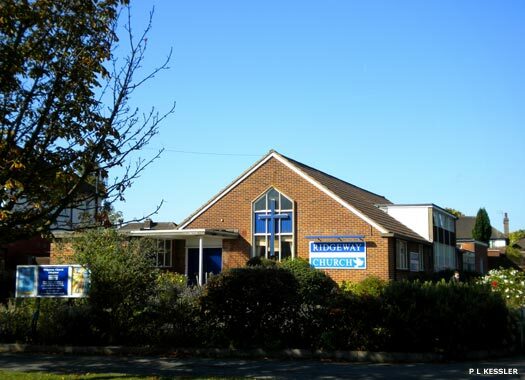 It was opened as a mission church in 1951 for St Peter & St Paul in Chingford, although the style of construction matches that being used at the time for average semi-detached houses across the country. The main hall is attached to the front and by 2009 looked a little dilapidated.